CHARLOTTE — When Christian Pulisic continued his American debut with Borussia Dortmund on Sunday in Charlotte, his entrance was stealthy but his impact was felt almost immediately. The 19-year-old came into the game as a halftime sub pressuring a Liverpool defense that barely broke a sweat in the first half of the International Champions Cup friendly at Bank of America Stadium. Despite nearly the entire stadium donning the Mighty Red, those who wore Borussia’s bright yellow kit more than likely had Pulisic’s No. 22 on their back. By the time his name was announced, a rousing cheer filled the stadium — even from the Reds. “On a day like this you have to stay strong, you have to show desire still or greed that you at least want to keep the result,” Klopp added regarding his own team. Borussia is only three games into its preseason, but Pulisic has continued to make his mark as the only American and one of the youngest on the squad. In Dortmund’s first game July 13 against Austria Wien, the right wing assisted the lone goal that put Borussia up 1-0. 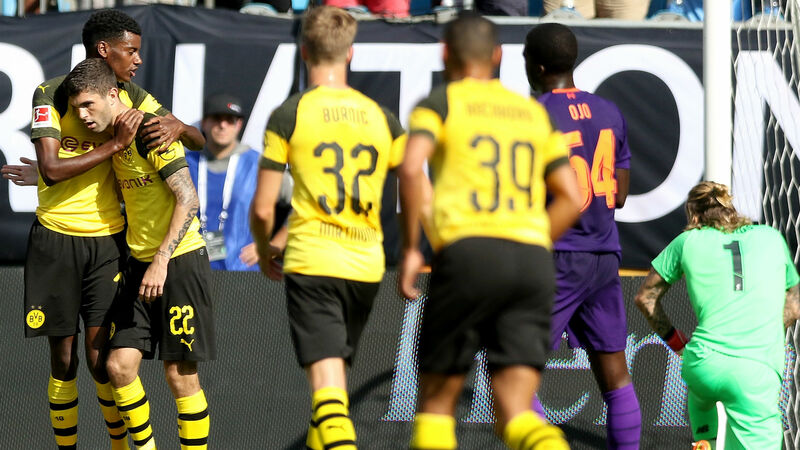 In the team’s ICC opener versus Manchester City on Friday, Pulisic drew a penalty that led to the game-winning goal. In Charlotte, he not only drew a foul in the box but then sent his penalty kick just out of reach of Liverpool keeper Loris Karius. Borussia’s goal in the 64th minute knotted the game at 1-1. He scored a brace to give Dortmund the advantage and assisted in the team’s final goal in stoppage time for the 3-1 victory. GOOOOALLLL! @cpulisic_10 wins the penalty and converts! Pulisic made his return to the US nearly nine months after his last game with the men’s national team. Barely clearing 5-feet 8-inches, the agile American is being praised as the newest and brightest star for the struggling U.S. men’s squad. The hopes of Pulisic’s presence in the states is also felt overseas, as there’s been talk of a potential trade that will certainly rival some of the huge deals that have been made recently including Liverpool’s Alisson, the most expensive goalie in the history of the sport. After Klopp shared his admiration for Pulisic on Saturday in a pre-match press conference, he again spoke highly of the American. Pulisic and the rest of Dortmund will travel to Pennsylvania, his home state, to face Benfica on Wednesday at Heinz Field.